← Café Montmartre: With Cesária Evora and Joan Miro! I started Swedish classes a few weeks ago and I remain extremely motivated despite the very slow progress. I’m afraid this probably contributed to increasing my annoyance level for my colleagues by a factor of 10. They remain very polite and smile when I try to speak Swedish but I can only imagine how painful it must be for them! I remain motivated because despite my lack of talent I enjoy learning new languages. I also enjoy the time I spend with my two teachers. They are both very good teachers. And during my last class I discovered that I shared a passion with one of them: cafés! I was already enjoying classes with her – not only is she a good teacher, she is also funny and, yes, not bad looking! – but now I have yet another incentive to learn the language: being able to discuss my café experiences in Swedish (unfortunately this is still a long-term objective). When she realized how much I enjoy cafés, the teacher decided that we would spend the last 20 minutes or so of the course looking at a map of Stockholm and exchanging tips about nice cafés. That was, after all, a good exercise to learn how to ask – and give – directions. This is why I decided to go to Sankt Eriksplan this morning: I was looking for a café that my teacher had recommended. She had warned me though that it was a bit different in the sense that it was almost like a “drugstore” selling natural stuff and that it was not always open. At least that is what I had understood. And I guess I got that last part right because the place in question seems to be open only on Mondays and Tuesdays! That was not really a problem. Sankt Eriksplan is a very nice neighborhood with plenty of café options. I just had to resist the temptations of going back to Balzac. That would have been too easy. And that’s how I found myself at Kaffeverket this morning. 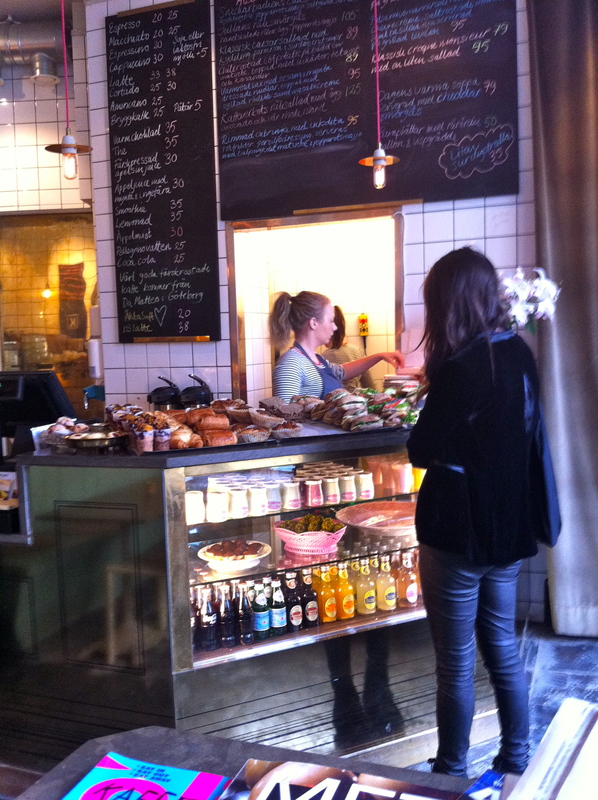 As soon as I walked into Kaffeverket I knew that I would love the place. 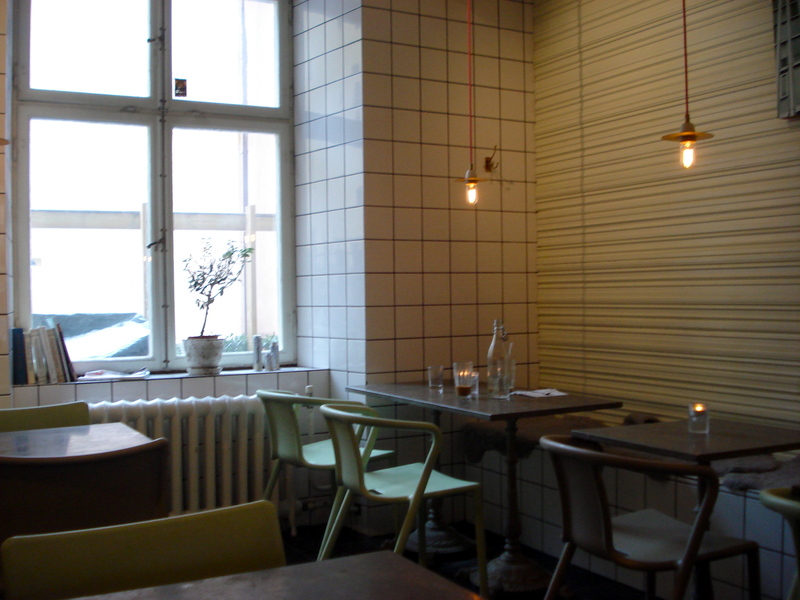 Kaffeverket is one of those places which feels warm but you can’t really explain why. 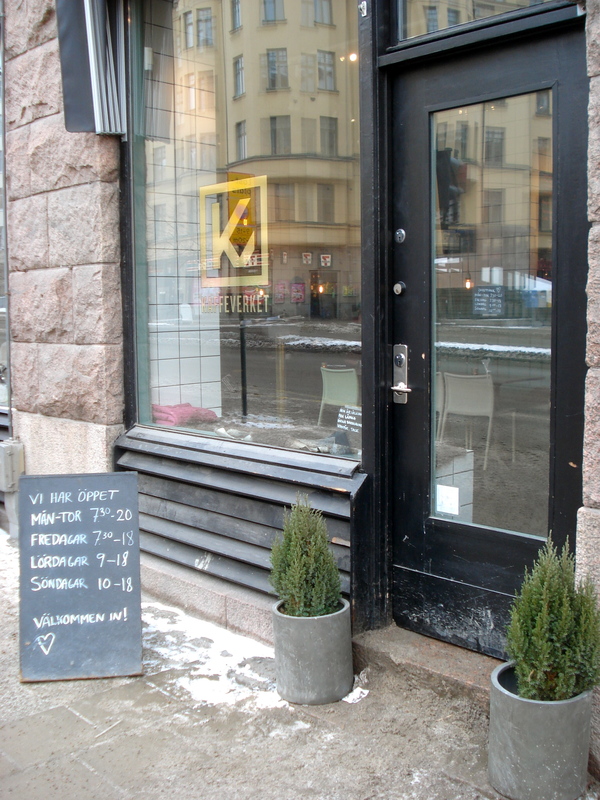 I guess it might have to do with the girls’ smiles behind the counter, the nice sandwiches welcoming you as soon as you open the door, or simply the cool Stockholmers enjoying their Saturday morning. 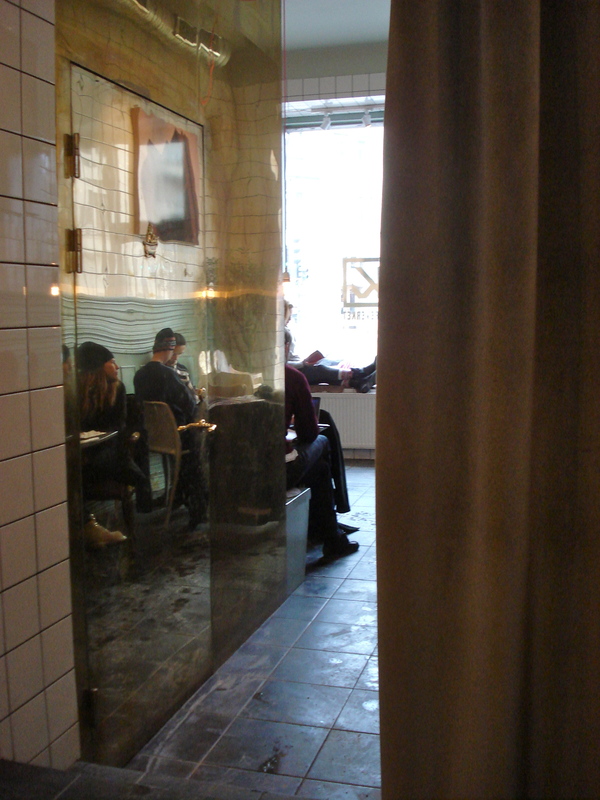 Kaffeverket is divided in 3 rooms: the one in front with two nice windows, and two smaller rooms in the back. Unfortunately the front room was full this morning. I could have stood at the counter with the magazines but I decided to sit in one of the back rooms and just enjoy the calm and the music. I drank a cappuccino while listening to Joni Mitchell. It made me smile when I heard “In France They Kiss on Main Street”. Despite being in the back room, I had a nice view on the street through one of the front windows. And on the young mom reading in the window while keeping an eye on the stroller she had left on the sidewalk. This is Stockholm after all, and a café would not be a café without at least a stroller outside! 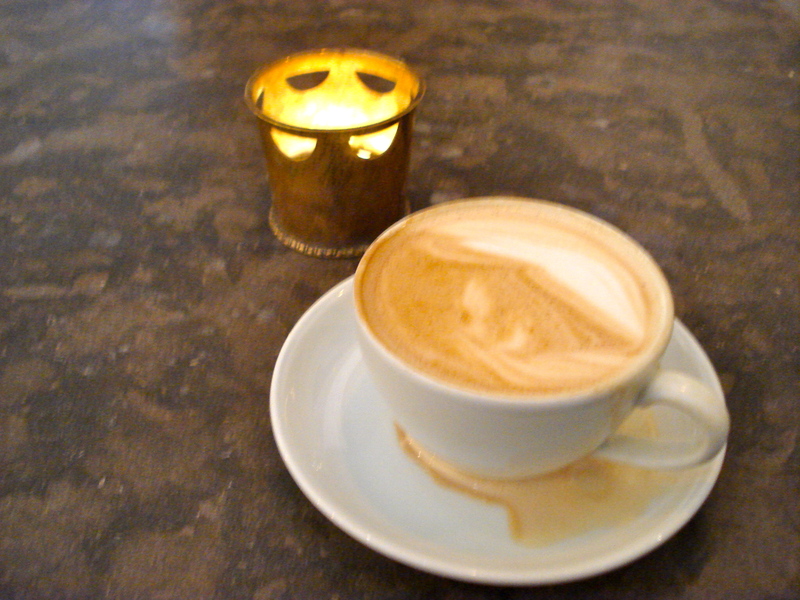 The coffee was good, but I will go back to Kaffeverket for the atmosphere. Kaffeverket has a really nice vibe. It also offers wifi. Kaffeverket has another location at Snickarbacken 7. I suspect I will pay them a visit there in the very near future. Kaffeverket, St: Eriksgatan 88, Stockholm. This entry was posted in Coffee, Music, wifi. Bookmark the permalink. Jag fick ett fint kort idag. Tack så mycket Linnéa. The timing was perfect… just before the test on Thursday! Hur är läget? Kul att kortet kom fram före testet! Jag såg att du bokat om dina tider så vi inte kommer att ses förrän på måndag, attans! Jag är sp himla nyfiken på vad som har hänt med din svenska samt att höra om dina nya caféupptäckter! Nu får jag hålla mig i skinnet i några dagar till. Förbered dig på ett firande på måndag!!! Ha en bra helg och vi ses snart! I’m looking forward to hearing more about your wild café experiences as we discover the wonder of the Swedish language together. Thanks for your kind words, things like that keep me going. You will be proud of me if you read the post from Tully’s. “ja vad kul” was supposed to be placed in this spot. I tried Kafé Elias the other day. Oh my goodness, the staff is sweet and attentive and the coffee is absolutely delicious. I like! Ok, let’s try something in Swedish: Jag tycker att vi borde ha fler klasser i kaféer. Jag håller med dig! Det kan vara bra att vänja sig vid att förstå svenska även i bullriga miljöer, för att inte nämna stimulansen av dofter, synintryck, smakupplevelser, förenat med din passion för Stockholms kaffehak. Ja, jag kanske behöver lite hjälp! Vi ses nästa månad. lovely post! the cafe looks and sounds like a lovely place! It’s so cool when you’re struggling with something, like learning a new language, though when you’re discussing s topic that really interests you – like cafes – it seems a little easier. Thanks Marina. I had a great time this morning at Kaffeverket! I know how it is, to learn a new language and get so frustrated because it isn’t as easy as you think. I knew some French guys who would watch Friends with English subtitles – and they found that actually improved their English. maybe the same if you had Swedish subtitles to English-spoken shows? I wish you luck with it! !